Five mukhi Rudraksha is ruled by planet of lessons Jupiter. Gives wisdom, learning and knowledge. This is popular among devotees of Lord Shiva, and commonly worn for health, worship and peace of mind. Maybe used for making bracelets, necklaces and Jewelry. 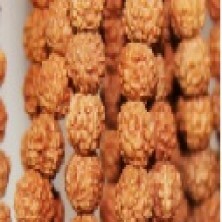 Number of beads in each mala: 108+1.